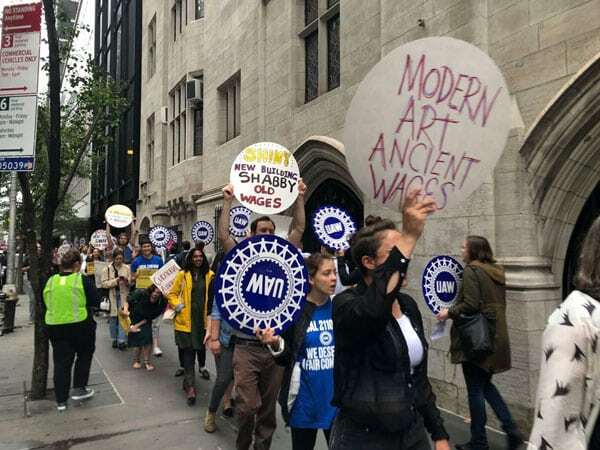 After a summer of discontent for staff at the Museum of Modern Art (MoMA) in New York City, the union representing most of the museum’s employees, UAW Local 2110, has negotiated a five-year contract that ensures salary increases, protects health benefits, and offers opportunities for upward mobility. As reported earlier this month by NPQ’s Steve Dubb, the contract negotiations have played out against a backdrop of a planned $450 million expansion and renovation, with management looking to hold the line on some staff salaries and benefits while making big investments in bricks and mortar. As reported in Hyperallergic, union members picketed outside the museum during the annual Party in the Garden fundraiser and staged a one-day walkout in the museum lobby on August 6th. The prior contract expired in May, and MoMA leadership and union representatives were at the bargaining table on and off for 122 days. Union members ratified the new contract on August 16, with 96 percent voting to approve it. And why wouldn’t they? Among the terms of the new contract are annual raises; fully subsidized health benefits for employees and steady rates for family coverage; protection for seniority “step raises”; and improvements in paid family leave, tuition benefits, and commissions and sales bonuses. Local 2110 representatives will also have access to new hires and opportunities to share with them information about the union contract and worker’s rights. Arts workers are often expected to make personal and financial sacrifices for the honor of working in a prestigious arts institution. It’s true that we are privileged to have the opportunity to do work we are passionate about, but that often comes with a price paid in undercompensated (and sometimes uncompensated) labor. Furthermore, this culture of “passion-as-payment” erects barriers for so many people who aren’t able to accept low wages or take unpaid internships in order to get their foot in the door, and this perpetuates the exclusion and lack of diversity that is so pervasive throughout the art world…Building the collective power of art workers through unionization strengthens our ability to set higher standards for wages, benefits, and job rights, conditions which I think lead will to a more inclusive and diverse art world. Similar sentiments about this “culture of passion as payment” might be applied to workers in many other less prestigious nonprofit cultural institutions—or, in fact, to those who work in other types of nonprofit organizations and subsectors, many of whom do not have a labor union to turn to. Often, nonprofit workers willingly subscribe to such a philosophy—or at least accept that there is little they can do to change it.